Alaskan Bush People follows the Brown family as they are determined to harness 34 years of wilderness experience to reclaim their dream of living free. Last season's finale was Feb. 28 (March 15 if you count the Lost Footage episodes). Three months between seasons is incredibly short. And based on reports from people in Hoonah, production of this season has been a chaotic mess, which makes the June 14 announcement even more baffling. Alaskan Bush People Exposed revealed that Ami is seriously ill, and not your usual "Seizure! I can't work!" Billy Brown Syndrome fake kind of ill. This sounds like a potentially life-threatening illness. Reports are that Ami is in Los Angeles to undergo testing and treatment, and she, Billy and Gabe will not be filming in Alaska this season. How will the producers deal with this situation? I didn't think that they were going to touch the PFD fraud case, but they did, and they twisted the facts to make the Browns look like the victims. This show has stumbled its way through so much absurdity, I doubt it can properly handle something as real and as serious as this (even Matt's alcohol issues turned into a farce). There's nothing AWESOME or EXXXXTREME about seeing a family suffer as its matriarch's health deteriorates. Of course, Ami's brother, Les Branson, has something to say about the rumors of Ami's illness. You may remember that Les helped orchestrate the "Memaw's Trip to Alaska" fiasco in which Ami's mother, Earlene "Memaw" Branson, traveled to Alaska in the hope of reuniting with her estranged daughter, only to discover that the Browns were in Hawaii. Earlier this year, Les put Memaw on camera for a series of Radar Online exposés about how Billy snatched then-15-year-old Ami away from her family and has controlled her ever since. (Memaw chimes in with "He lied!" every few minutes, which shouldn't be funny but is.) Radar Online recently got Les to comment on Ami's illness. "Since his sister refuses to speak with him, Les said he is planning to call L.A.-area hospitals in a desperate bid to find the allegedly ailing star," the story says. Good luck with that, Les. Last season introduced us to Noah's latest love interest, Rhain, who up until recently went by the name of Ruth. If you thought Rhain was annoying, you're not alone. She's like the Poochie of ABP. The family doesn't want her around, and the producers don't want her on the show (they probably don't want to pay her, either). 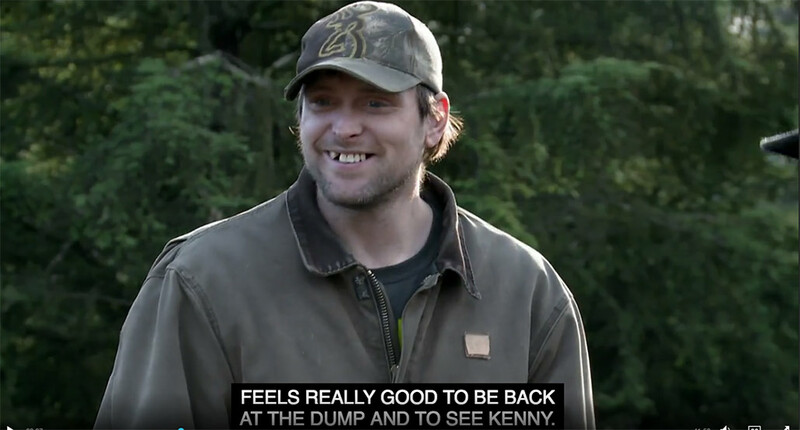 It's clear to anyone watching that Rhain embarked on her "Alaskan adventure" solely to get on TV, and she's not very good at feigning enthusiasm or a romantic interest in Noah. But I admire her tenacity. Rhain's really hellbent on seeing this thing through. If it were anyone other than Noah being played for a chump, I might feel bad for him. Bam bailed on the show in the middle of last season, choosing to follow a ladyfriend around the Lower 48 instead of performing in the Brown Family Circus. We know that the ladyfriend is former ABP producer Allison Kagan, and they're reportedly married. Based on fan photos with Bam on social media, he's spent most of his winter in South Carolina. He's been recently spotted in Las Vegas, and is expected to do some filming for the new season in L.A. It's safe to say that Bam is weary of being a cable TV "celebrity" and having to pose in random people's selfies everywhere he goes. Bam, being the sensible Brown, probably realizes that ABP has become ridiculous, and he can't stand to see his family continue to be portrayed as a bunch of dopes. Good on him. "She is reported to have no known mental health issues, and no suicidal statements had been made. Alisha has allegedly been talking to cast members from the TV show The Alaskan Bush People as of recently." Oh, that explains it. There's a small segment of obsessed APB fans who are as detached from reality as the show itself, and they're a particularly gullible lot. It's unclear what role "The Alaskan Bush People" played in Alisha's disappearance. She may have been chatting online with a Brown imposter. She may have been hearing the Browns' voices in her head (Good Lord, I hope it wasn't Noah's voice). Or she may have been in serious need of attention. In any case, Alisha was found safe.